Size reductions were made with the use of a reducing machine which employes the pantograph principle. The larger medal to be reduced is first duplicated in steel, since this metal is much harder. From the steel mold the reducing takes place mechanically onto a steel die.The machine uses a tracing point and cutting tools. The result is a hub (Hochschnitt) which has to be worked over for the fine touches by a skilled hand engraver (in Goetz's case by the artist himself). The hub is then hardened in a high temperature furnace and from this, the final die (Prägestempel) is manufactured by impressing the hub image into the die under extreme pressure. 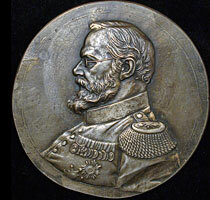 After several other stages of treatment, such as turning the die in a lathe, adding detail mechanically, polishing the die to a mirror like finish and grinding it to the finished dimensions, the die was then ready for striking the first medal.